For years, leading corporate organizations have put their trust on us to train their top performers because we understand that in order to run a successful and profitable business, staff must constantly be motivated, supported and inspired. Through a series of carefully executed team building activities and games, employees get to brush up their skills in communication, planning, problem-solving and conflict resolution. At Anani Villa, we provide exclusively tailored itineraries to better suit each company so that employees would be directed towards the company’s goals while still having fun and adventures in a relaxing environment. 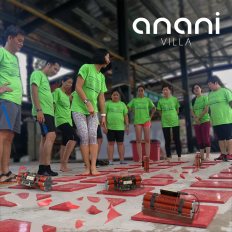 Anani Villa is managed by Mad Group Sdn Bhd (HRDF Registered Training Provider) and the team building programs are HRDF Claimable. An ethical culture represents the organization’s ethics personality, therefore, it is imperative for organizations to constantly remind and train their employees on that matter. Good ethical behavior reflects smart business practices, so we strive to train employees to use ethics as a behavioral guidance in the workplace. Encouraging physical and mental health through adventurous recreational programs. We offer a wide variety of outdoor team building activities and games. Every activity available at Anani Villa is designed not just for fun but for personal and team growth. All team building activities are carefully directed towards your organization’s goal. Leaders are not born overnight, they are created through effective leadership training. Being a great leader means you’re able to manage tasks, function well and know how to behave as a leader. Our training program greatly encourages future leaders to engage the team in reaching collective company’s goal. Get to know how to win them over through inspiring and empowering actions. Make a difference in the lives of people who need it the most. Performing charity work as a team can help build stronger bonds, strengthen communication skills and boost morale. From Charity run, contributions to Orang Asli community, food donations collections, we can help arrange all that for your company. Honestly, these type of team building is the best for any company. Organizations need excellent customer service team to compete in today’s customer-oriented environment. Understanding customer’s wants, needs, and expectations are crucial. All this can be achieved by possessing an excellent interpersonal relationship skill which will enable effective communication with customers. Through this program, participants will learn that to ensure sterling service standards, the whole customer service department must work as a team. If sitting down discussing the topic seems a bit boring, rest assure, we can integrate the concept into team building activities instead. Let us know the specific knowledge and the skills set you wanted your employee to learn so custom-made program may be developed to train your employee. Proper training programs are proven to improve staff’s productivity in their current roles. All this in return will increase company’s performance and revenue.